As everyone knows, CERN devotes its time and resources to unlocking the secrets of our universe. 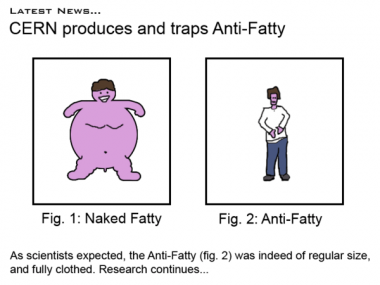 After years of tireless research, they have discovered the one particle required to utterly obliterate Naked Fatty. I’m thinking I might have to go over to CERN and destroy that research. Thanks Colin! On thursday I went to the pub for a couple of drinks, since a friend was in town. When I got home, I found my music hard drive was playing up. Again. It’s been playing up for a couple of months now, and even though it’s the only place my 40,000 songs are stored I kept on putting off buying a new hard drive and transferring the data over. Big mistake. Thursday evening came, and I stumbled in from the pub. The drive was playing up again (it kept on going to sleep and refusing to wake up). A quick search on the internets told me that this was something peculiar to the old MyBooks and a quick firmware upgrade would fix that. You can tell where this is going, can’t you? So, I did the firmware upgrade (which was apparently successful), and low and behold everything stopped working. No more booting RAID enclosure. At this point, the WD RAID checking software was telling me that both the disks in the enclosure were dead, but that it was trying to perform a rebuild. I panicked, removed power, and ran onto amazon to buy a new bare 1Tb drive, and a drop-in SATA enclosure with delivery for saturday morning. Saturday came, and I dropped the first of the two original disks into the new enclosure to see if I could see any data. Lo and behold it was there. Happy day! The fact that I dropped almost £400 on the RAID array back in 2007 had finally paid for itself – I hadn’t lost my music! Long story short, the other drive in the array was properly dead, but for whatever reason the array wouldn’t rebuild from the working drive. So, eight hours later I’ve copied all the data off the working drive and now have copies on a further two drives. Clearly the original enclosure is no longer happy, so I’m going to have to source a new one to drop a few drives into. I’m not caring about it being a NAS – I’m expecting to attach it directly to my MacMini. This means it’ll have to either connect via USB or Firewire800 – no eSATA for me I’m afraid. So, any ideas internet chaps? 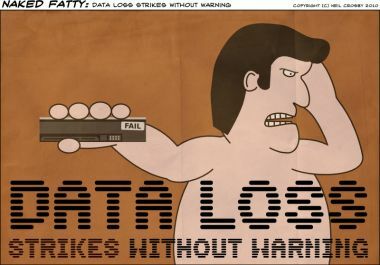 Oh, and whatever you do – don’t forget to back up your lovely precious data.